The Indian market is still the second largest smartphone market in the world, second to online the Chinese market which remains the largest smartphone market in the world. Chinese manufacturing giant, Xiaomi, took over the Indian smartphone market as the best selling brand in 2017 and since then, it has a firm grip on the market. 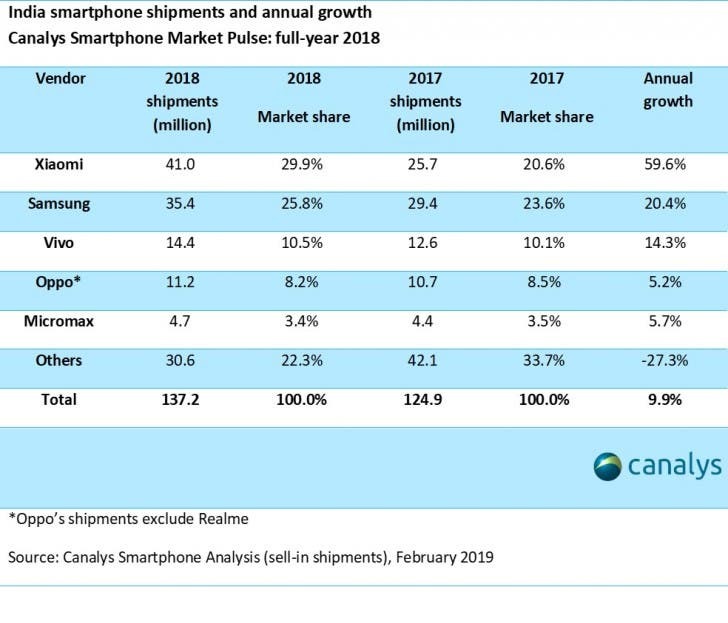 Market research firm, Canalys, reports that the Indian smartphone market grew 10% over 2017. Its reports also states that in India,12 million more phones were sold in 2018 compared to 2017. Looking at the year past, Xiaomi still tops the Indian market with a market share of 29.9%, selling 41 million smartphones. Samsung, vivo, Oppo, and Micromax completes the top 5 ranking with a market share of 25.8%, 10.5%,8.2%, and 3.4% respectively. Two notable names missing from the list is Huawei and Apple which fall under the “others” category. Oppo’s value excludes Realme since the company needs to be treated as a separate entity thus Realme’s performance also falls under the “others” category. India is now the largest smartphone market for Xiaomi and the company shipped 10 million smartphones to India in Q4 2018 while it shipped 9.4 million smartphones to China in the same quarter.